Las Vegas - Before his friend and former sparmate fights in the main event, Ray Beltran (R, above photo) took the stage in what is one of the biggest events of his career. Beltran (29-6-1, 17 KOs), a former sparring partner of Manny Pacquiao at the WIld Card Gym, ushered in a win for the famous gym by dominating Ushmanee in the co-feature of HBO's Pay Per View Telecast of the rematch between Pacquiao and WBO welterweight champ, Timothy Bradley Jr. The rugged Beltran did not disappoint his fans as the former world title challenger punished and dominated Arash Ushmanee (20-2-1, 10 KOs) of Red Deer Canada in their 12 round battle to score NABO's lightweight belt with a Unanimous Decision victory. 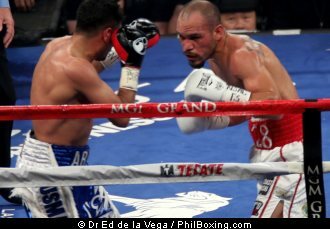 All judges at ringside have it for Beltran with scores of 118-110, 117-111 and 117-111. Ushamanee, a replacement for Beltran's original opponent, Roman Martinez, who fell ill, received hard left hooks to his body and head which Beltran threw with authority. Beltran's timing was beautiful as majority of his power shots found its target on Ushmanee but the Canadian fighter took it well and never tasted the canvas from it. A last moment heated exchange between the two energized the crowd, a sort of a jolt shot in preparation for the Main event tonight at The MGM Grand Garden Arena. As a result of this win, Beltran will be back as a major challenger for a world title in the lightweight (135 pound) class.